Our friends over at KTM recently announced the return of two cutting edge single cylinder 690s. 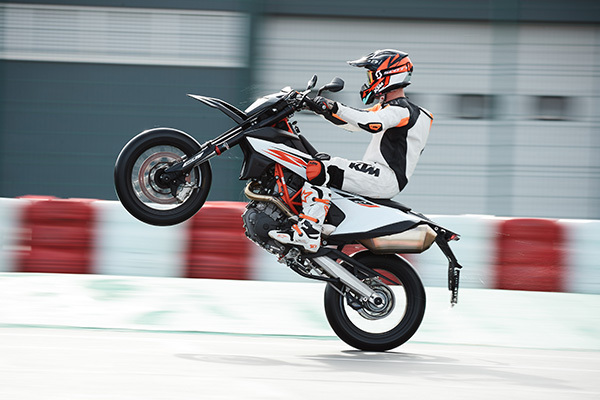 One of the bikes, and the focus of this blog post is the 2019 supermoto stud - KTM 690 SMC R.
KTM describes its latest supermoto machine as “Pure, extreme and high performance”. The 2019 edition of the 690 SMC R is a step up from KTM’s previous models, featuring improved ergonomics, fully adjustable APEX suspension, the latest compact LC4 engine and electronic rider aids such as traction control and lean angle sensitive ABS. The 2019 690 SMC R is available for preorder from our Tewkesbury showroom. Pop into the shop or call our team on +44 (0) 1684 292929. All of KTM’s new releases are backed up with a wide range of KTM PowerParts and as UK’s only Premier KTM dealer you can count on AMS to have the parts you need to keep your bike humming.